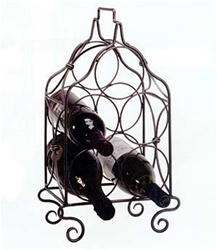 This Bordeaux Collection rack evokes the elegance of the French Quarter with its graceful styled wrought iron and brass-colored accent rings. Holds 5 bottles. Gift boxed. Dimension 18"H×9"W×6"D.